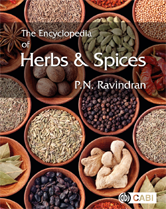 The Encyclopedia of Herbs and Spices provides comprehensive coverage of the taxonomy, botany, chemistry, functional properties, medicinal uses, culinary uses and safety issues relating to over 250 species of herbs and spices. These herbs and spices constitute an important agricultural commodity; many are traded globally and are indispensable for pharmaceuticals, flavouring foods and beverages, and in the perfumery and cosmetic industries. 41. Capsicums - Capsicum ssp. 93. Indian Cassia - Cinnamomum tamala, Cinnamomum spp. 235. Wild Thymes - Thymus spp.